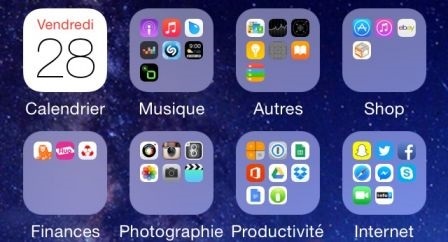 After some time of use, the iPhone quickly crumbles under the app icons. We find ourselves juggling among the various screens filled to the brim. But where is hidden this game bought once in promotion and that did not look bad? So, whether you're obsessed with storage, messy or lazy, everyone has a way to organize their smartphone. Let's see some of them, which may be able to inspire you. Without thinking too much, we can arrange its applications in a rather conventional way by type, with, ideally, the creation of folders that will group different applications of the same genre (all games together, for example, or all applications social, etc.). Finally, we follow the categories of the App Store a little. Otherwise, for the most rigorous, the arrangement in alphabetical order can be considered and always remains effective. Nevertheless, it seems difficult to apply for a very high number of applications. Organize not by letter, but by frequency of use, here is an idea of ​​storage already more relevant. We leave the applications most often open on the main screen and its neighbors on the right and on the left, and the poor applications almost useless are found in the back room, that is to say on the screens at the ends. .
More suitable for a large number of applications, the storage place of use can also work well. We keep, for example, a screen or a folder filled with applications for leisure (games, movies, series, music), another for work (tools of productivity, writing, specifically related to your activity), or one for the car (GPS, radio, radars).Similarly, storage can be done either by location, but by time or day, with a screen or application folder for weekend applications (sports, recipes, music and movies for example), one for working time, and then one for the evening time before bedtime for example (waking, reading, podcasting or radio applications, etc.). We can also consider less academic organizations. Non-storage can work for some with the habit. But even if it remains practical to some extent with a few dozen applications installed, it can quickly become a puzzle if you approach the hundred. It is therefore generally not recommended to let applications fall one after the other. Organizing by color can also appeal to the most visual of us. Applications are sorted by their icon color. The visual effect is obviously at the rendezvous, but what about the efficiency for large volumes of apps. Finally, without having to be confined to a single method of storage, the idea is to build the organization that will suit us best, whether it is one or the other method, where a mixture of several.But do not forget that one consults his smartphone on average 150 times a day ..., so it deserves to look at its organization. And you, how do you store your apps? 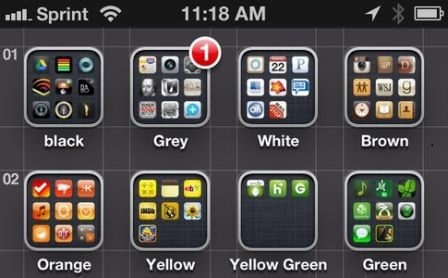 0 Response to "Classify and Organize your apps on iPhone and iPad"